Reading and share top 12 famous quotes and sayings about Wardrobes by famous authors and people. Browse top 12 famous quotes and sayings about Wardrobes by most favorite authors. 1. "The Citizen's attic was, objectively, breathtaking. 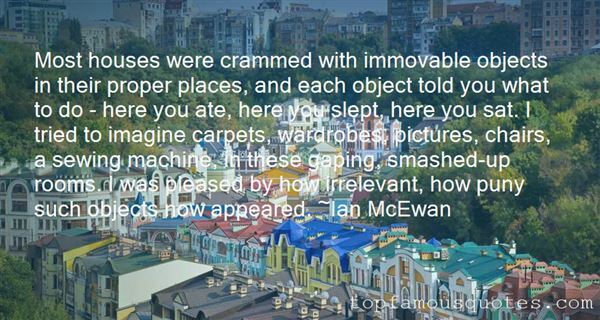 The place was littered with trunks and old clothes and wardrobes and pieces of furniture and strange metal toys no one had played with in sixty years and half-painted canvases and on and on. There were several round windows to let in the sunlight, and I loved how it raked its way across the floor as I watched, dust dancing like sugerplum fairies in the bold yellow glow. If attics could make wishes, this one would have nothing to wish for." 2. "Daryl shrugged. "If wishes were wardrobes, we'd be in Narnia." 3. "The seventeenth of March. In other words, spring. Desmond, people who think themselves smart, I mean those in the height of fashion, women or men - can they afford to wait any longer before buying their spring wardrobes?" 4. "For white men, to live is to own, or to try to own more, or to die trying to own more. Their appetites are astonishing! They own wardrobes, slaves, carriages, houses, warehouses, and ships. They own ports, cities, plantations, valleys, mountains, chains of islands. They own this world, its jungles, its skies, and its seas. Yet they complain that Dejima is a prison. They complain they are not free." 5. "Well, they're magical wardrobes, of course, although they don't lead to any fairy wonderlands." 6. "You come to this place, mid-life. You don't know how you got here, but suddenly you're staring fifty in the face. When you turn and look back down the years, you glimpse the ghosts of other lives you might have led; all houses are haunted. The wraiths and phantoms creep under your carpets and between the warp and weft of fabric, they lurk in wardrobes and lie flat under drawer-liners. You think of the children you might have had but didn't. When the midwife says, ‘It's a boy,' where does the girl go? When you think you're pregnant, and you're not, what happens to the child that has already formed in your mind? You keep it filed in a drawer of your consciousness, like a short story that never worked after the opening lines." 7. "Most houses were crammed with immovable objects in their proper places, and each object told you what to do - here you ate, here you slept, here you sat. I tried to imagine carpets, wardrobes, pictures, chairs, a sewing machine, in these gaping, smashed-up rooms. I was pleased by how irrelevant, how puny such objects now appeared." 8. "Like any child raised on tales of magical worlds beyond paintings and mirrors and wardrobes, I had yearned to enter Middle Earth, to reach through." 9. 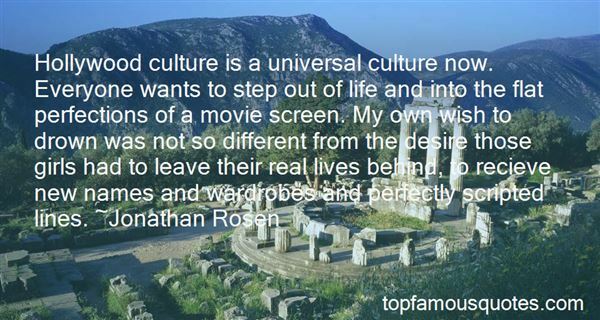 "Hollywood culture is a universal culture now. Everyone wants to step out of life and into the flat perfections of a movie screen. My own wish to drown was not so different from the desire those girls had to leave their real lives behind, to recieve new names and wardrobes and perfectly scripted lines." 10. "I suppose the best way to tell the story is simply to narrate it, without an effort to carry belief. The thing did not require belief. It was not a feeling of horror in one's bones, or a misty outline, or anything that needed to be given actuality by an act of faith. It was as solid as a wardrobe. You don't have to believe in wardrobes. They are there, with corners. (The Troll)"
11. "We're all made to the same pattern. Knitted up like a thrifty housewife's sock from scraps - random unravelled bits of yarn that used to make someone else, chance combinations from the hand-me-down wardrobes of dead strangers.But surely the execution must have an effect? 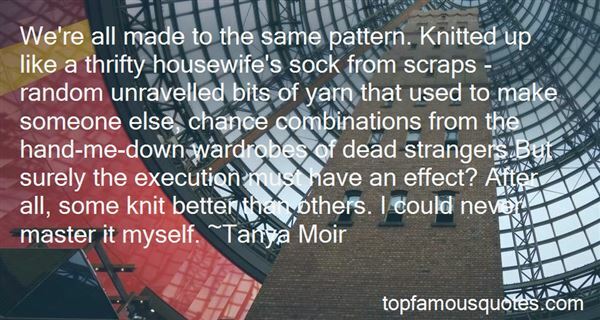 After all, some knit better than others. I could never master it myself." 12. "What people had had shed and left--a pair of shoes, a shooting cap, some faded skirts and coats in wardrobes--those alone kept the human shape and in the emptiness indicated how once they were filled and animated; how once hands were busy with hooks and buttons; how once the looking-glass had held a face; had held a world hollowed out in which a figure turned, a hand flashed, the door opened, in came children rushing and tumbling; and went out again. Now, day after day, light turned, like a flower reflected in water, its sharp image on the wall opposite. Only the shadows of the trees, flourishing in the wind, made obeisance on the wall, and for a moment darkened the pool in which light reflected itself; or birds, flying, made a soft spot flutter slowly across the bedroom floor." Originally a stylist took terrible dresses and did everything she could to make them wonderful. Now, you create an image. It's much more specialized."